Tutorial: How to modify default skin and make your tab bar more user friendly. The tab bar of the default maxthon skin is rather awkward. At first, every tab is equal length, no matter how long or how short the title is. Then, as more tabs open, they shrink their length, until only the site icon and few letters remain. User can not recognize which tab is what by glancing at the tab bar. Now how about tab size fit to the title of page when the title is short, and they won't shrink too much when too many tabs open? Would it be nice to show FULL title on the current tab? Today, I will guide you how to make this happen by modifying the default skin. Very clear indtructions. Even penguins can undestand that. Well done that guy. Great tutorial, Brother ... great to see some tutorials around here. I found it by accident and think it might be good to link them together. Also, readers, don't overlook the Skin SDK posted in another pinned thread in this Topic Area. I've found it to have some very educational documentation to help learn how to do skins. Keep up the good work. Many of us will apreciate it. First thank you for your post. Would it be possible to show us how would you move the favorites bar to the window frame? This would be in between the minimize button and the tab scroll of your AwesomeTabs skin. Thanks; I was wondering how to get those working! And here is my awesome skin. Thank you very much for you time and effort you put in this inspiring awesome skin design tutorial. Any Idea how to move the favorites to the window frame?? Do you mean both tab bar and favorites bar in the window caption area? I have condensed my favorites to three folders. I like to move them to the window caption area (I call it the window frame). 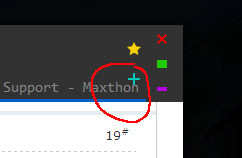 When Maxthon is maximized it should appear on the far right of the Tab bar. Next to the minimize button. When Maxthon is not maximized it should be just on the far right of the tab bar. I tried to attach two pics. your test skin is exactly what I needed. Just remove the entire style. When you code: width: max-intrinsic !important; you told Maxthon this: "Dude, I don't want you to shrink my tabs anymore, leave the tab size as is", so the tabs overflow, and you can not see the overflowed tabs, until opened tabs reach a certain number(based on your screen width), the "more tabs" button appears. So, you have two options, either use the default behavior, or use a scroll bar, just like the first post of this tutorial. just where that could be that information? i look for container.css and container.menu.css cant find, somewhere else? Well, the "more tabs" button can not be displayed by a skin, it's controlled by Maxthon program. You can, however, display a tab list menu. For an example, you can take a look at my post "My Maxthon skin collection", skin number 4.
its normal that right click on tab list menu not closing page? 1. Yes, this menu can only switch tabs but not close them. 2. Tab bar will not move unless it is scrollable.